It’s Ash Wednesday, the first day of the Church’s 40 days of inventory, reflection, and commitment, to Christ’s passion and sacrifice; it’s the path to redemption, the humiliation of the human God, and the glorious climax of the Divine Man, which we call Lent. We can “put out into the deep” during this time and find that there is something we should be doing as fellow Catholics for those in our communities. During Lent, something is happening that most garden-variety Catholics do not even have on their radar-screen. A small seeding that grew somewhere quietly is being fed, nurtured, and mentored right in the heart of a soon-to-be Catholic. Most Catholics attending Mass on Sundays see this garden growth with the calling of the names during Lent, the special blessings, and the sending forth prior to communion of these individuals. Maybe even then, it is just an added attraction that extends the Mass a bit, as does an occasional baptism. But, there is more to this and each and every Catholic sitting in the pews has a part in the process. The RCIA program is not just for newcomers, it is meant for all Catholics. Like planting a garden, the selection of the seeds, their needs of sunlight, water, and good soil are important for a successful harvest. Careful planning of what, when, and how to plant the seeds, even preservation of the new seeds for the next season are considered. Preparation is key to this process and without help from family members and friends, it would be a lonely and even daunting job. 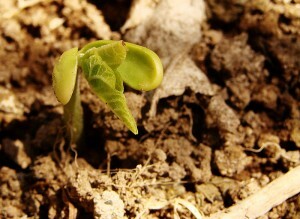 As with a spring garden, those in the RCIA programs in your parish are experiencing new growth. They are studying, being nurtured, taking classes, and in need of our prayers. During Lent, they are coming to the end of their journey into the Catholic Church. The goal in sight is a celebration that takes preparation. How they got here, what brought them to this place and who will help them during and after they arrive is Catholic-based. The seed has come to the surface, desiring more sunlight, water, and fertile soil to continue to grow and blossom. So get out your watering cans, put your garden gloves on, and see where you can be a part of this for someone. Yes, pray for them, smile at them, and speak to them with encouraging words. Be a welcoming face in the new community that they so desire to be a part of. This is what Lent is all about. Yes get rid of the candy for 40 days, stop snacking for a few weeks, pray the rosary and stations of the Cross, most definitely! But, remember the newcomers, remember them spiritually, physically, and make the sacrifice of time and effort to support them during your Lenten journey this year. This is a level far deeper than giving up candy.